On Saturday 22/10 the U10s took part in a mini end of session blitz hosted by Ballinteer Saint Johns on their all-weather pitch next to Ballinteer Community School. Two teams of 12 girls from FoxCab competed against a very strong BSJ in 2 matches of 20 minutes. In the first of the matches, BSJ gave FoxCab a lesson in swarm defence, near hand tackling and aggressive breaking of the tackle. However, in the second game FoxCab were more determined and fought back to level the competition. All in all, it was a great experience for the girls and everybody came away with a medal and happy faces. 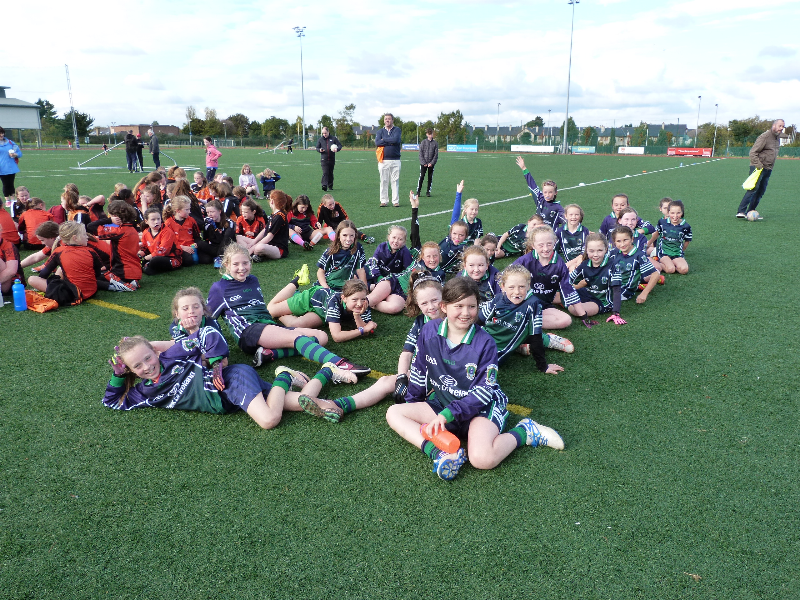 Two teams from the U10 squad played Cuala on a beautiful Saturday afternoon (08/10) in Meadow Vale. Twenty four girls turned out to play two games of 20 minutes. Once again the girls displayed an improving passing game with great supporting play going forward in attack. Their work in defending is improving with more determined blocking and tackling together with a greater determination to win back lost ball. The mentors would like to congratulate the girls for working together as a unit and in supporting each other in attack and defence. 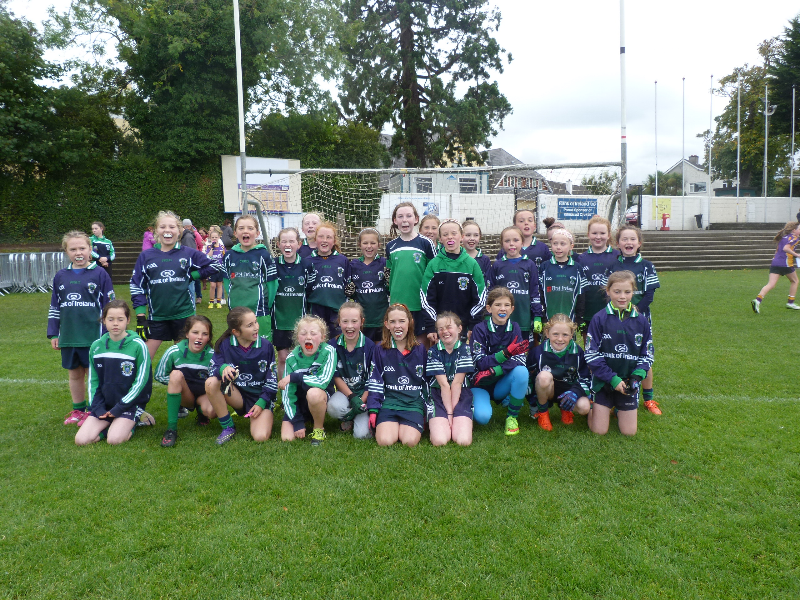 After a long spell of heavy rain early on Saturday 01/10 the weather cleared up for the U10s challenge match against Kilmacud in Pairc de Burca. 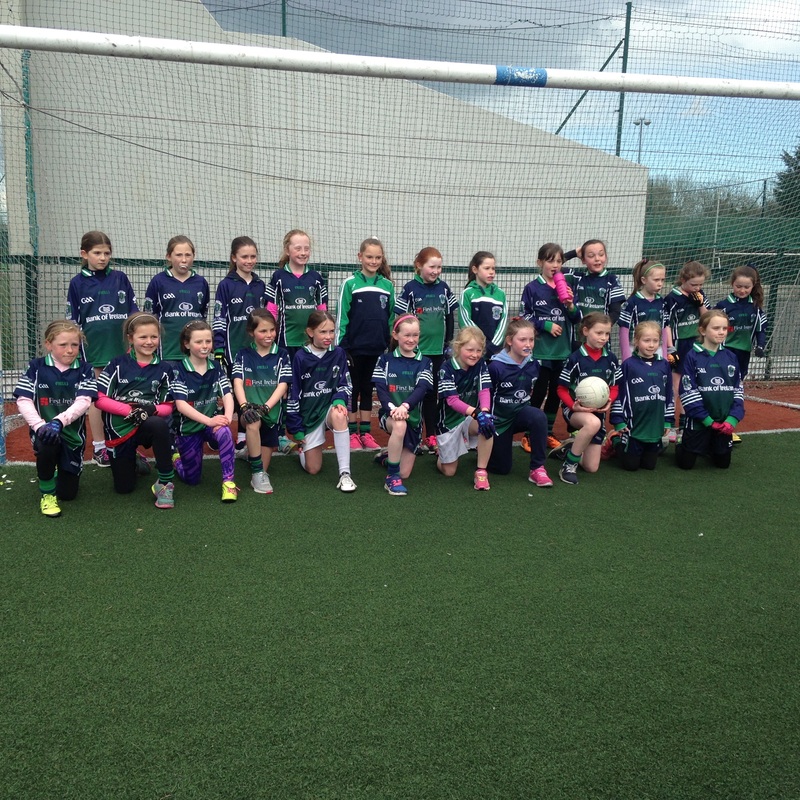 Twenty six girls turned out to play in two teams against two strong Crokes teams. As usual the girls put in a very determined performance and showed some fantastic improvement in defending and regaining possession. Moment of the day was when Millie Aherne, who was surrounded by 3 Crokes players, displayed great composure and skill and passed with an overhead kick to one of her FoxCab team-mates. On very sunny Saturday afternoon on the 14/09 the FoxCab U10s welcomed our neighbouring club Shankill to for a friendly match in Kilbogget. Over twenty U10s girls turned out to play against a determined Shankill side. Our girls displayed some great speed and skill to put on a very on a comprehensive display and control of the game. We encourage the parents to keep the girls active and to show up for all matches. 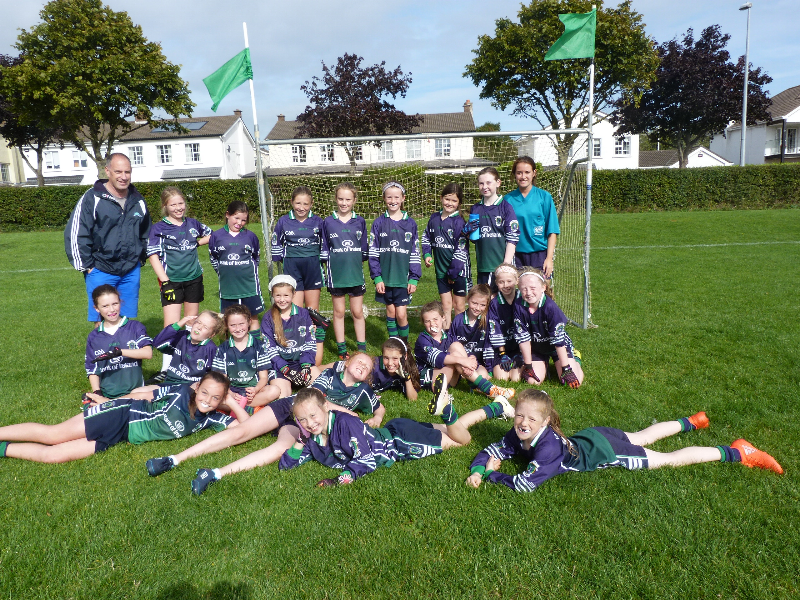 On Saturday 10th September a group of 22 girls and their parents from the Foxrock-Cabinteely GAA under-10 team travelled to Cork to take part in the Passage West GAA Ladies Football Blitz. 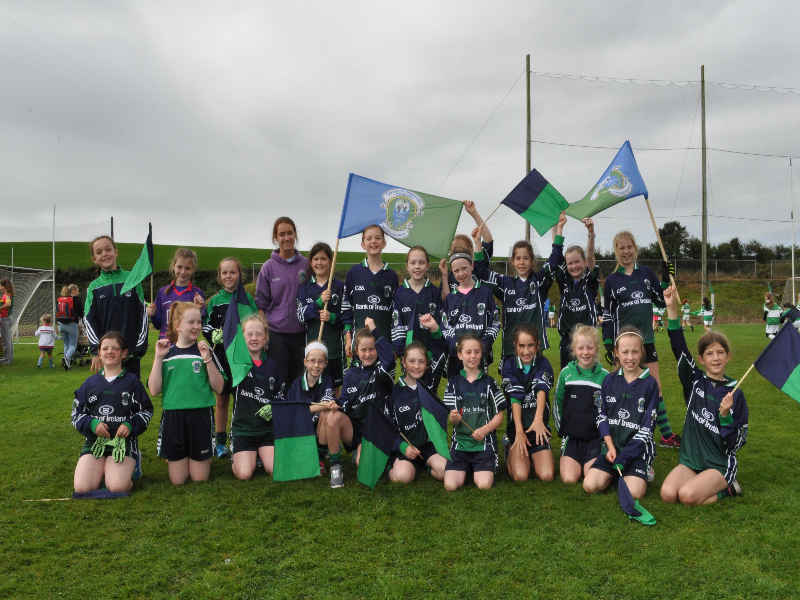 This year, the blitz was one of the largest tournaments in the country with over 1800 girls representing 102 teams from 12 counties competing in the under 8 to under 10 age group. The FoxCab team bus left Foxrock church at 6am on Saturday morning to travel down to Passage West. Despite the early start all the girls and parents were in high spirits. On arrival at Passage West GAA the girls joined the other 100 teams to take part in the Blitz Parade and which started just after 10:45. In the meantime the parents set up base camp adjacent to one of the pitches and settled in for a very enjoyable day of sport and fun. The girls were split into two teams of 11 and between them they played 11 matches during the course of the afternoon. Both FoxCab teams had to work hard against some very strong competition. This gave the girls an opportunity to demonstrate the full range of their footballing skills, team work and fighting spirit. All the girls received a medal for participating in the blitz which finished by 4pm. The team then went on to a local hotel for a well-deserved refreshment and dinner before hitting the road back to Dublin. The team and mentors would like to thank all of the parents for their support with special thanks to Crotty Insurance for sponsoring the team and to David Curren from Centra in Monkstown Farm refreshments. 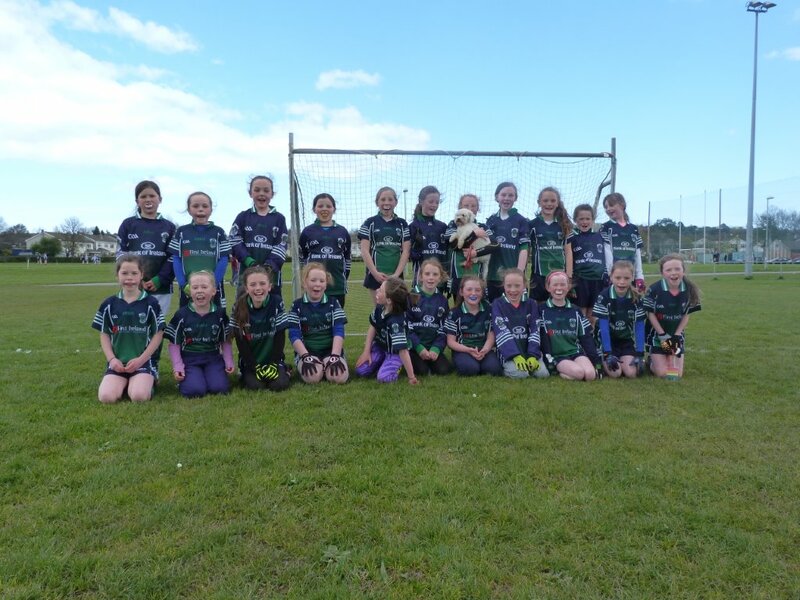 The U10s with the help of three U9s played in the Leinster Blitz held in Bray Emmets on Sunday 19th June. Two teams of 9 competed against teams from all over Leinster with each team playing 5 games of 15 minutes. FoxCab demonstrated fabulous team play, both teams playing very well and fended off some tough opposition! Credit has to go to the girls for playing the full tournament with not substitutions - a long tough tiring day. A special mention to Jade Carroll who injured her wrist while blocking a ball in the last game of the day. Fortunately, the injury was revealed to be no more serious than a sprain following an x-ray. We wish Jade a speedy recovery. On a busy communion weekend the U10s (with the help of two U9s) put together two teams to play a very strong Clanna Gael Fontenoy side. The girls battled hard against strong opposition and driving rain to put in a solid performance. It was fantastic to see the girls working hard in difficult conditions to gain possession and then to display some great soling and passing skills. We had some difficulty converting our greater possession into scores so we'll be working on this aspect more in training. The Clanna Gael manager was very complimentary of the girls and their performance so we left on a positive note. Special mention to both Erin Ivie and Sarah Byrne (U9) who were both outstanding in defence and counter attack. Thanks to all the parents for your support during a busy weekend. On Saturday 23/04 FoxCab U10s hosted a team from Kilmacud and one from Shankill on a dry and sunny afternoon in Kilbogget Park. Two teams of 11 represented FoxCab, each playing a very strong and skillful Kilmacud outfit and a determined Shankill team. The matches were played in good spirits and were enjoyed by all with special mention from Shankill regarding FoxCab's blocking skills. The outstanding player of the afternoon was Eavan Bresnan who displayed exceptional skill, determination and stamina in both of her games. Emily Jane Bell made some notable solo runs scoring against the run of play and Thea Green and Lucy Campbell both put on great displays of footballing skill. Many thanks to all of the parents who helped set up the pitches and collect the gear after the matches. The U10s had another great afternoon out in Ballybodden today. They had a good, competitive game and played very well. It is great to see them controlling the ball a lot better between themselves, and remembering to call each others' names. A special mention to Erin Ivie who played extremely well. Thanks to all who came out to support the girls, regardless of the hailstones!! A mix of FoxCab U9s and U10s welcomed Shankill GAA to Kilbogget Park on Saturday 09/04 for a two-game friendly match. Shankill were represented by girls from U9 through to U12 to form one team of 11 players. Because of the larger FoxCab numbers the balance of our girls played between themselves while each of two twenty minutes matches against Shankill were played. Yet again FoxCab put on an excellent display of teamwork and passing to edge ahead of a strong and determined Shankill team. Many thanks to all the parents who showed up early to set out the pitches before the game and then help get everything back to the containers after the game. Saturday April 2nd 2016 was a wet, cold and muddy day in Kilbogget. But conditions didn't take away from a very competitive match between FoxCab U10s and Kilmacud Crokes. Yet again a great display of determination, skill development and competitive spirit from the FoxCab girls. Two teams of 8 represented FoxCab in two matches apiece against a strong opposition in a fairly balanced competition. Well done to all the girls and many thanks to all the parents for sideline support and particularly to those who helped set up and dismantle the pitches. The U10s played their first scheduled County Board match this Saturday against Cuala in Thomastown Park on a lovely dry(!) and sunny afternoon. 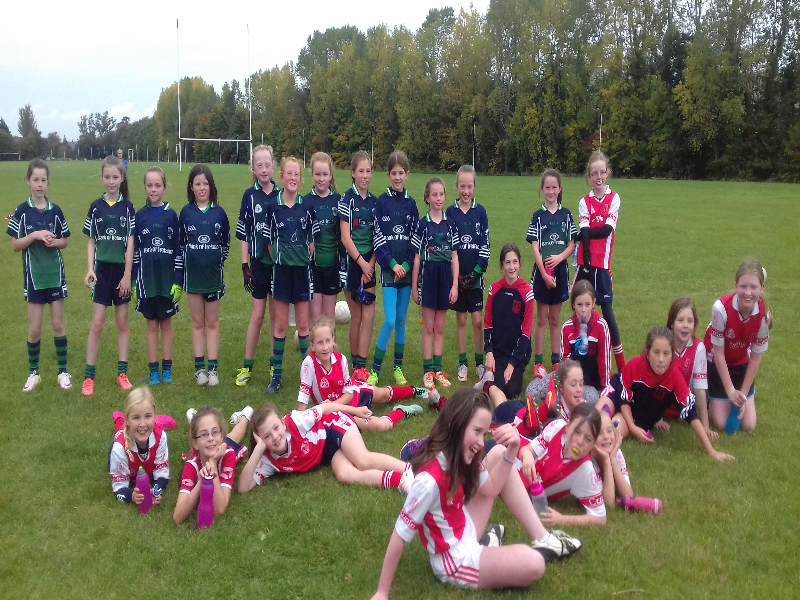 Twenty five girls came out to represent FoxCab making up 2 teams who played two matches each against a determined Cuala. As our mentor, Emma McSweeney put it .. "the girls couldn't have played any better and they should be very proud of themselves". It was fantastic to see the girls working hard to gain possession and then following this up with some great passing sequences and combining together to convert some great scores. Thanks to all the parents for full attendance and support before, during and after the game. Your assistance adds to the skills development of the team and management during training and matches. 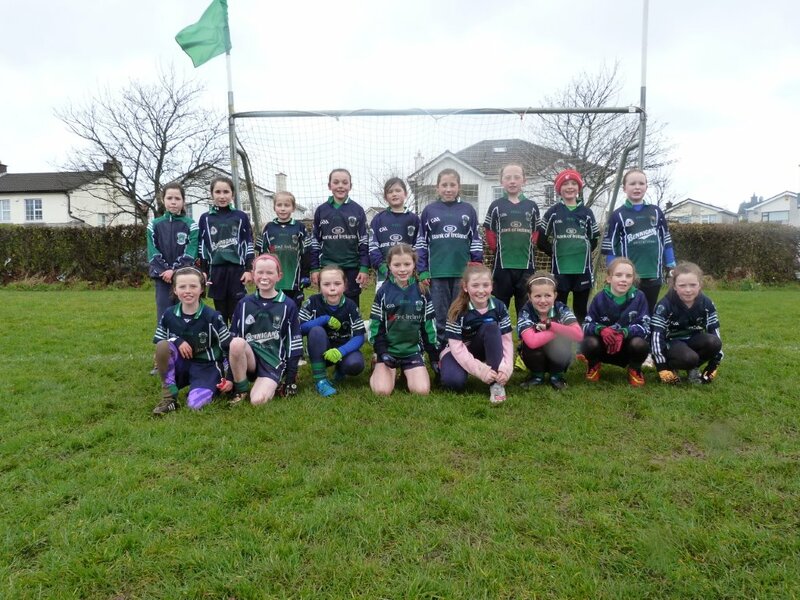 The U10s had another great challenge match on Saturday (20/02) when they played away against Bray Emmets. Two teams of 9 represented FoxCab in two matches apiece against a strong opposition. The rain and near gale force winds did not dampen their spirits and the girls had to work hard in difficult conditions. The girls rotated positions each half and everybody played back, midfield and forward. It was great to see a high level of teamwork together with some great hand and kick passing skills on display. Our newest team member, Ella Carey put on a great display of catching skill and speed to the ball, particularly as it was her first game with the U10s. Despite the wet and cold weather everybody; players, parents and mentors were in high spirits after the game. Many thanks to all of the parents for your continuing support in helping to set up the pitch, running warm up drills and helping with jersey washing. 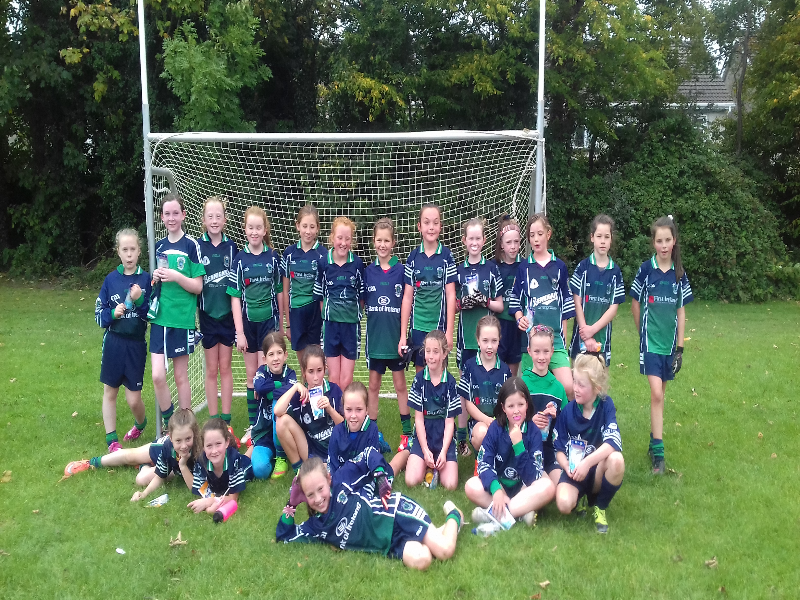 The U10s had a great start to their playing session on Saturday when the girls put on a great display of skill, determination and enthusiasm in a challenge fixture away against St. Jude's. Two teams of 11 represented FoxCab in two matches apiece against a strong opposition. Both teams battled hard and there were some great scores, both goals and points. However, the FoxCab girls showed a more lively pace and better accuracy on target.